AfriClassical: Demarre McGill & Kate Hatmaker, Art of Élan, Announce 8th Season of Concerts with The San Diego Museum of Art, Starting Oct. 28, 2014 with "Aria"
Demarre McGill & Kate Hatmaker, Art of Élan, Announce 8th Season of Concerts with The San Diego Museum of Art, Starting Oct. 28, 2014 with "Aria"
Steven Schick conducts Anna Clyne's "Within Her Arms" at the "Reflections: on loss" concert at the San Diego Museum of Art, February 2014. Photography by William Zauscher. We are thrilled to announce our 8th season of concerts in partnership with The San Diego Museum of Art, which we're appropriately calling "The Song Goes On" in salute to the resilience and spirit of the San Diego Opera. The 2014-2015 season pays homage to the beauty and power of the human voice and that timeless expression of the human spirit--opera. This year's creative approach to programming will take concertgoers on a season-long journey of classical music and song. The musical arc, starting with ARIA and finishing with EPILOGUE, features the West Coast premiere of a new work by Chris Brubeck (son of famed jazz musician Dave Brubeck), the return of The Myriad Trio, the Art of Élan debut of local soprano Priti Gandhi, and a performance by Art of Élan's first-ever "ensemble in residence," The Formosa Quartet. 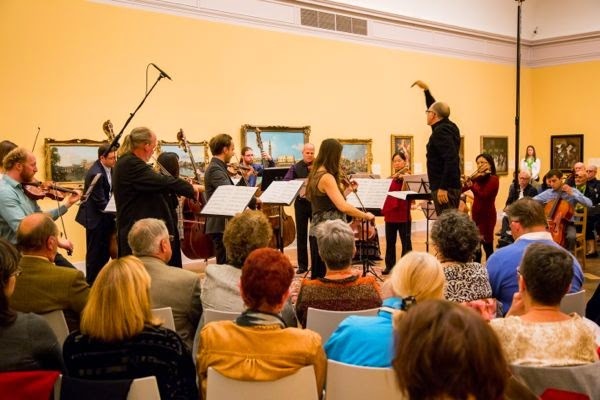 March 3rd, 2015 "Prayers and Songs"
All museum shows begin at 7PM and are followed by "Encore at the Prado," where concertgoers are invited to enjoy happy hour food and drinks with the musicians at The Prado, right next door in Balboa Park. Art of Élan's eighth season at The San Diego Museum of Art begins with an engaging and varied program of lyrical works spanning four centuries, including dramatic and colorful compositions by the provocative 34 year-old composer Nico Muhly and the Art of Élan debut of sparkling local soprano Priti Gandhi in Respighi's Il Tramonto, an enchanting setting of Shelley's poem The Sunset for voice and string quartet. The program also features Argentinean composer Heitor Villa-Lobos, Baroque master Henry Purcell (excerpts from his opera The Fairy Queen), and Italian opera icon Giacomo Puccini's lush Chrysanthemums quartet. Tickets available at the door, in advance at the Museum, or online HERE!!! To purchase by phone, call the Museum Box Office at 619.232.7931. Ask for the season subscription discount!! Have you ever been to ARTS (A Reason To Survive) in National City? This fall is your chance!! On October 11th Art of Élan begins a 10-week residency with this fabulous organization that believes in the power of the arts and creativity to literally transform lives - especially those of kids. Consisting of weekly workshops, where ARTS students and alumni have the opportunity to work directly with Art of Élan musicians, the residency will culminate with a unique multidisciplinary and collaborative concert on December 6th, featuring the music of Terry Riley, David Lang and select ARTS music students and apprentices. To make things even MORE exciting, arts advocate Carol Lazier and the Stensrud Foundation have offered their support of this initiative with a $5000 challenge grant. Any amount donated between now and our culminating concert at ARTS on December 6th will be matched dollar for dollar, up to $5000.